Fluff + Fold – Clean. Green. Express. Just Like Mom, Only Slightly Better. 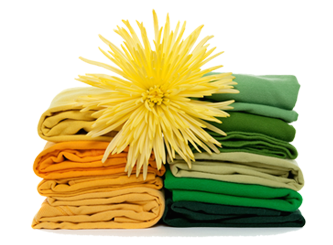 We offer the very finest in wash, dry & fold services for your valuable laundry. Our Fluff & Fold is perfectly suited if you are on the go and just can't find the time to get your laundry done either at home or using our self-serve washers and dryers in our store. Do you miss your mom? Give us your dirty laundry, we'll wash it, fold it and package it up for you. What could be easier? Do you want more time for fun on the weekends? Hand your laundry off to us. Drop It Off: drop off your laundry any time during our business hours (M-F 7AM-9PM, S-S 6PM-9PM) and we will weigh your order and begin processing it immediately. Our normal turnaround is usually 24 hours or less, but we are happy to rush your order same day* if needed. Just be sure to drop off your wash load before 11AM. Also, all orders are subject to a 10LB minimum. There is no maximum weight. Bundle Wrapped + Handled With Care: We take great pride in our care of your laundry. We separate all of your colors and whites making sure to wash them in different loads. Once finished we neatly fold and wrap it in our famous all natural kraft paper and into secure bundles complete with your personalized name label, individual order details and inspection certification. No Size Limits: No job is too big! Bring us your comforters, blankets, tablecloths, sleeping bags and bed spreads, etc. We can handle all of the items that make your washer at home tremble in fear. Clean. Green. Express. will pickup the items for your door and return them back. This service is also available for doorman buildings, workplaces and corporate accounts. Just let us know the time, lace and any specficis you have and we'll come pick up your laundry and do the rest. It's that simple. Contact Us Here For Delivery Services. We are committed to doing our part to preserve the earth's resources. We only use high-efficiency equipment to reduce our water and energy use. you can feel good knowing that by choosing our laundry services you are conserving the earth's natural resources. Learn more about our conservation efforts here. We service the entire metro Los Angeles area via our Hollywood and Pasadena locations. Visit your nearest location here.